My dress was by Lipsy, I bought it on sale at Peek & Cloppenburg, which is a German chain of retail clothing stores offering lots of different brands in varying price ranges. I wish I had a pictures showing the whole outfit including my shoes because they were awesome (and killed my feet), but my mum is not very ... talented with a camera so the pictures on the right is the best I can do I'm afraid! I did my hair myself - I curled all of them and brushed the curls out after they cooled down (it's day 3 today and they're still super bouncy, I don't know how that happened but I absolutely love it). I then did some kind of half-updo where I teased the crown of my hair and pinned those strands back together with the front strands and that's basically it. It wasn't terribly inspired or hard to do, but I liked it and I didn't have to worry much about my hairdo coming undone because it was so basic - yay! I had a great time on Saturday night - it's been absolutely ages that I had an opportunity to wear a nice dress and make an effort. 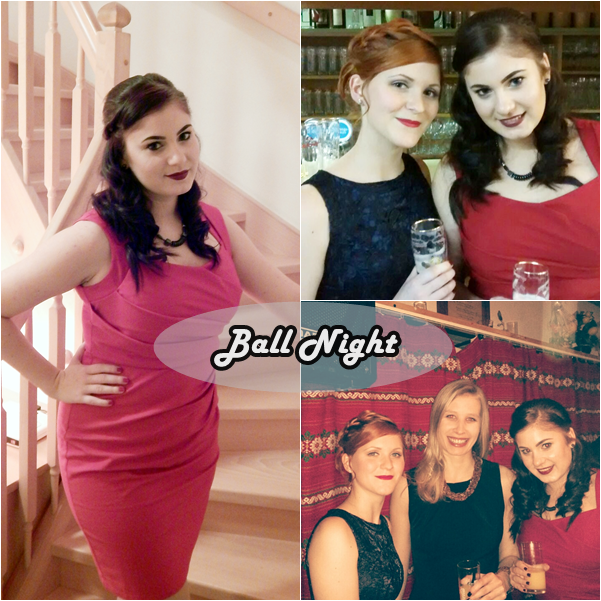 Sure, this wasn't exactly the Vienna Opera Ball (where Austria's high society pretends that having money equals taste in clothing ...), but I love the thought that since it was organised by the Red Cross of my hometown, we were supporting a great institution with our money.